Each year, we set aside one day, Labor Day, to honor American workers, who put in extremely long hours and are incredibly productive. That is the least we should do. We can and should do much more. As a start, we should take this holiday to recognize and reflect on the fact that there is a war that is being waged on the very workers we are honoring. The results of the war are clear: Despite the admirable productivity of America's work force, all of the gains generated by the hard work and long hours has gone to a tiny sliver of our society, in recent decades. As the chart below shows, America's income growth has gone overwhelmingly to the top 1 percent in the last four decades. It hasn't always been this way: From 1948 to 1979 two-thirds of aggregate income growth in the United States went to the bottom 90 percent. But from 1979 onward, nearly two-thirds of growth went to the top 1 percent. Perhaps even worse, the aggregate income of the bottom 90 percent actually declined! 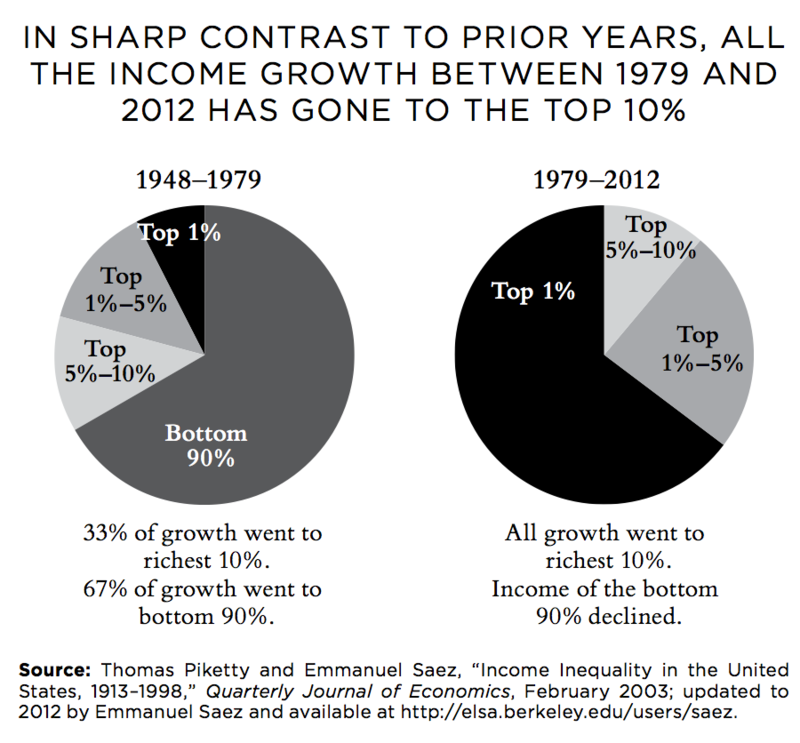 This massive upward redistribution of income didn't just happen by accident. It is the result of the war on workers. The war has many fronts, and many people reading these words are engaged in the fight. Some are fighting for a minimum wage that is a living wage; fighting for just compensation for overtime (and, hooray, for President Obama's new overtime rules): fighting to defend and protect public employees; fighting against all kinds of wage theft; fighting to defend workers who seek to organize; fighting to defend unions and the crucial role they play on behalf of all workers. These are just some of the fronts. I am engaged in yet another: the fight to defend and expand Social Security. Though not everyone might recognize the fight over Social Security as part of the war on workers, it most certainly is. Along with current cash compensation, workers earn Social Security through their labor. They earn Social Security's life insurance protection, long-term disability protection, and deferred compensation in the form of retirement income. When workers earn less in take-home pay, their Social Security benefits are lower, as well. And many are fighting to cut those benefits, in an effort to dismantle this source of economic security for America's workers, whom we honor each Labor Day. Those benefits are too low, as it is. And, unless legislation to expand Social Security is enacted, they will be even lower in the future. In 1995, Social Security replaced 43 percent of the wages of medium earning workers turning age 65 and retiring in that year; today, that retiring worker would only receive 40 percent of wages; and workers born in 1960, and retiring at age 65 in 2025 will receive only 36 percent of their wages. Their younger siblings, retiring at age 62 in those years, would receive 35 percent, 33 percent, and just 30 percent, as the result of benefit cuts now being phased in. And this does not take into account the taxation of those benefits nor the rising health care costs that take a larger and larger bite out of those already modest benefits. To win on every front in the ongoing war against workers, it is imperative that there be solidarity. Those on the other side seek to turn us against each other. They seek to direct our anger against immigrants, for example, though foreign born workers are being exploited just like American-born workers. In the case of Social Security, they seek to turn young workers against retired workers, though both groups are struggling economically. In magic, it is called misdirection -- an effort to distract from the real action. Those waging the war would love for us to fight each other, despite the obvious truth that there is more that unites us than divides us. President Franklin Roosevelt understood this well. In defending Social Security, he reminded us, "It is an old strategy of tyrants to delude their victims into fighting their battles for them." The tyrants to whom he was referring were the monied class -- the same tyrants today bankrolling politicians who support the policies that have resulted in dangerous and perilous rising income inequality. President Roosevelt was not fooled or deterred. In response to those interests, whose hatred he welcomed, he pushed through far-sighted legislation. Among the visionary legislation were the enactment of a minimum wage and maximum hours, protections for workers who wanted to unionize, and Social Security. Those enactments were followed by the creation of a vibrant middle class, sustained economic growth and a fairer distribution of the fruits of that economic growth. We should learn from the past. We should fight together to raise the minimum wage, protect and strengthen the ability of workers , expand Social Security and other legislation that helps us all. We should work together, as well, to elect leaders who will fight with us. On this Labor Day, I am grateful to those who are engaged in all the various fronts. For my part, I am committed to continuing to fight to get the truth out about Social Security and fight for its expansion. With all of us fighting in solidarity on all of these related battles, I am confident that future Labor Days will be more than times to praise our nation's workers and enjoy the last days of summer. They will be days for true celebration.